If you’re looking to add a unique touch to your wedding or engagement ring, you’ve probably already considered some sort of gemstone as an alternative to the commonly utilized diamonds. 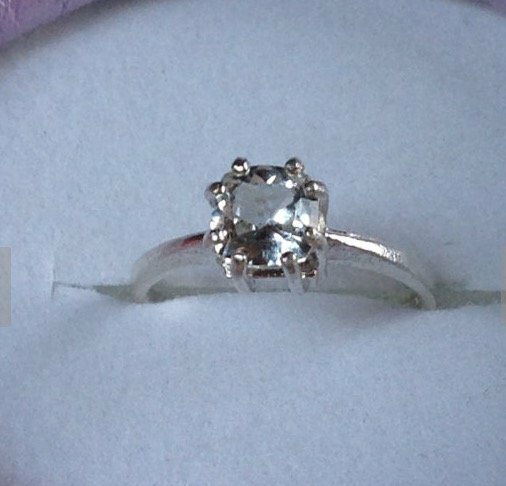 The possibilities that come with a gemstone addition are essentially endless and the decision could be a stressful one. Beryl is an astonishingly resilient mineral that makes up some of the worlds most coveted gemstones. This mineral ranks at an impressive 7.5 -8 on the Mohs Hardness Scale and consists of some extremely popular and well known gemstones, such as emerald and aquamarine. 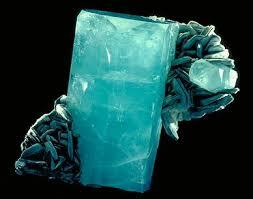 As a mineral, beryl is made up of Beryllium Aluminum Cyclosilicate and, in its pure form, is colorless. What gives this the various forms of Beryl its colors is internal impurities – which in some instances, can also have a negative effect on the toughness (ability to withstand pressure) of the stone. The six gemstones that make up the Beryl family are Aquamarine, Bixbite, Emerald, Goshenite, Heliodor and Morganite. Now lets take a look at each of these forms of beautiful Beryl in the order we just mentioned. Aquamarine is one of the most popular varieties of Beryl. This precious gemstone captivates gem collectors and jewelry connoisseurs with its pastel blue tones that, at times, offer greenish undertones. The hues of these colors will vary but they are usually described as ‘sky blue’. Aquamarine, the birthstone of March, typically forms as a flawless stone with little to no damage to its exterior – what more, it has been known to form as big as a foot long! – making this stones carat size and clarity less price indicative features than the intensity of its beloved hue. Aquamarine is a transparent stone that displays a high volume of luster, making it an appealing addition to any jewelry. 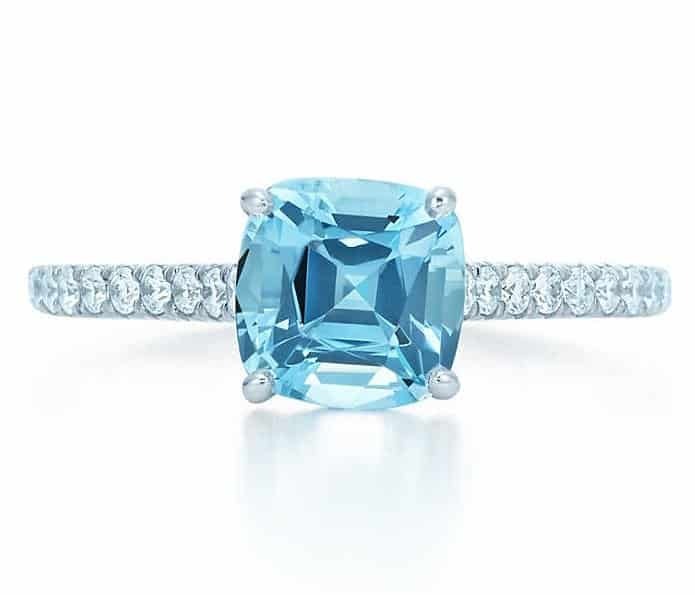 As a Beryl, aquamarine has a Hardness level that will vary between 7.5-8, which not only explains why it’s the most popular of all the light blue gemstones, but also makes it an ideal addition to any wedding or engagement ring. Unlike some of the other Beryls, Bixbite isn’t a well known gemstone outside of the collector world. This lack of popularity of ‘the red Beryl’ is highly due to the fact that Bixbite is one the world’s rarest and most highly coveted gemstones. Bixbite’s rarity can be attributed to the traces of manganese that give it its unique coloring, and the uniqueness of the environment in which manganese becomes introduced to the formation of Beryl minerals. 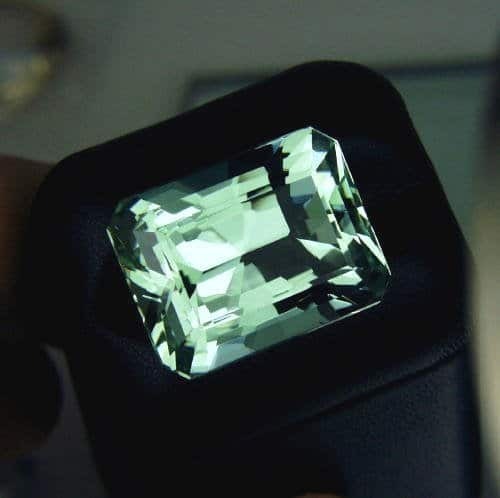 Because bixbite is as rare of a stone as it is, low price tags may be indicative of it being an imposter stone being sold as a Beryl – when buying an engagement or wedding ring composed of this stone, do so from a reputable jeweler and consider a second appraisal following your purchase. Emerald is a green Beryl that owes its alluring deep green coloring to chromium inclusions. 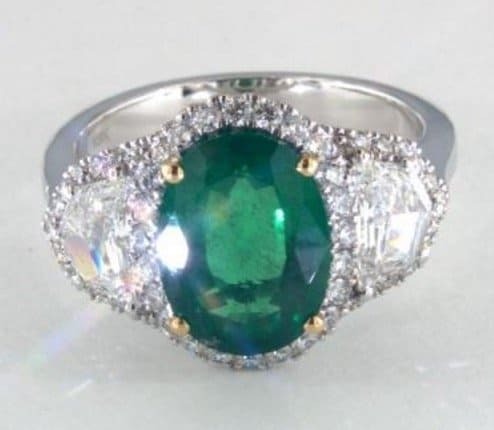 Emerald is a unique in that its color essentially names it – if an emerald is too light, it is no longer considered an emerald, to the exact hue that differentiates an emerald from a non-emerald is still ambiguous amongst gemologists. Emerald is a durable stone, with an Mohs Hardness rating that varies between 7.5 and 8, but it isn’t necessarily a tough one. The beautiful color of Emerald also means that this stone contains numerous inclusions that weaken the stone’s ability to resist breakage. This fragility of Emerald resulted in the creation of the now highly coveted Emerald cut – a stunning cut that’s made to protect the breakable features of this gem. Despite its lack of toughness, Emerald still manages to reign as one of the most valuable and popular of all green gemstones and makes a beautiful addition to wedding or engagement rings that will be given a little extra TLC. Goshenite is a colorless gemstone and, as such, is a Beryl in its purest form. Goshenite is also rated as a 7.5 – 8 on the Mohs Hardness Scale and, due to its general lack of inclusions, is an impressively tough stone. The lack of inclusions in Goshenite also result in the astonishing transparency of this stone – one that resulted in Goshenite having had been historically used torn the manufacturing of eyeglasses! Despite its many positive features, Goshenite isn’t a very popular form of Beryl and isn’t particularly expensive – good news for a bride and groom looking for a beautiful diamond alternative without breaking the bank! Heliodor is another form of Beryl that manages to remain attainable and affordable despite its undeniable beauty. Heliodor, which obtains its color from iron inclusions, is considered the gold Beryl. However, term gold Beryl is misleading because Heliodor actually possesses hints of green within the stone that make the entirety appear greenish-yellow and the less green it possesses, the more flawless the stone is considered to be. 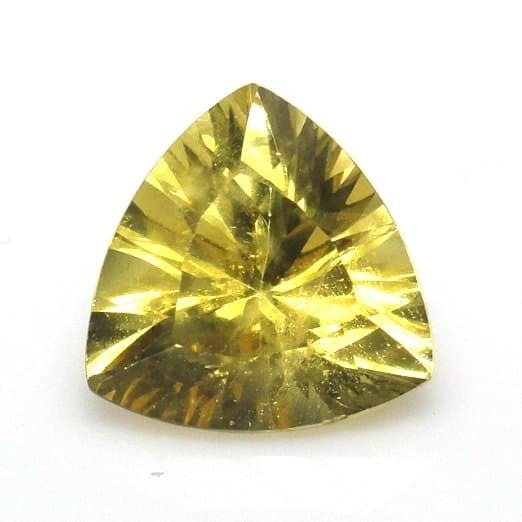 Heliodor ranks at the same level of Hardness as other Beryls, between 7.5 and 8 on the Mohs Hardness Scale, and is gifted with impressive toughness and captivating luster. 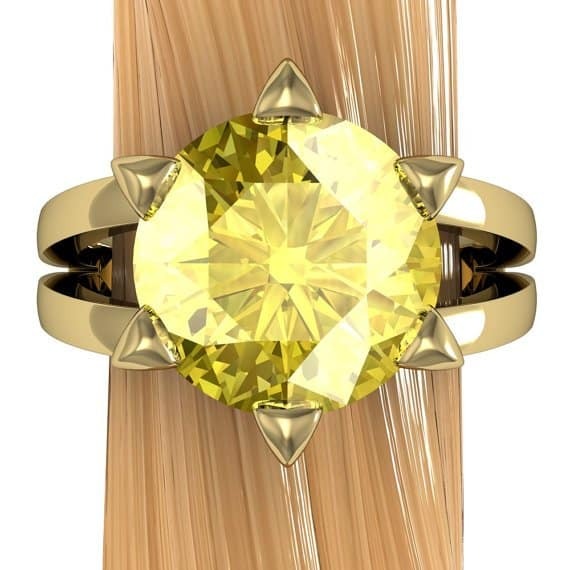 A completely flawless heliodor is reminiscent of a canary diamond and makes a perfect and affordable alternative for one in wedding and engagement rings. 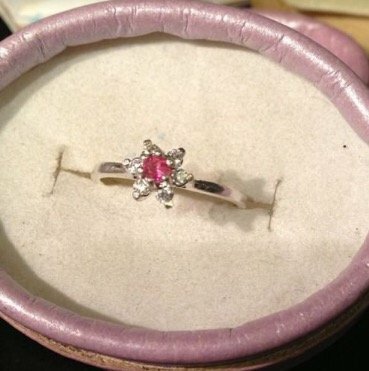 Morganite is a pinkish orange shade of Beryl. The coloring of Morganite is often compared to Salmon, or a very light coral, and comes from the inclusion of Manganese within the stone. Natural Morganite even has yellow undertones, though the yellow is often altered through heat treatment before the stone becomes sellable. 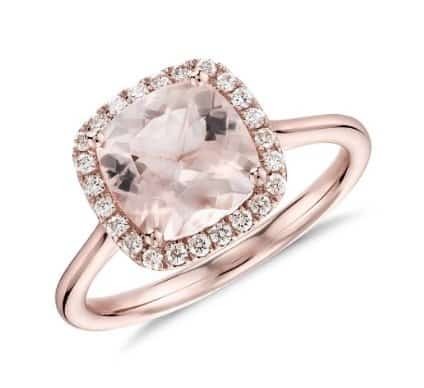 Click here for 10 of our all-time favorite Morganite rings! Unlike many other stones, heat treatment does not affect the impressive hardness, stability and durability of Morganite nor does it decrease the stone’s value. Morganites delicate color goes well with all band materials and its physical properties go well with most lifestyles, making an amazing addition to wedding or engagement rings.